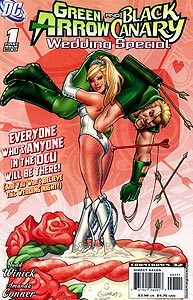 Assistant Editor: Tom Palmer, Jr.
Brief Synopsis: Black Canary and Green Arrow encounter many, many obstacles on their way towards matrimonial bliss. Issue Notes: This is a one-issue special (the last of several leading up to the Wedding Special) that precedes the series Green Arrow/Black Canary. Issue Reprints: This issue was collected in Green Arrow/Black Canary: The Wedding Album. Booster Gold is in attendance at the wedding of Black Canary II and Green Arrow being held within the Happy Harbor Secret Sanctuary of the Justice League, here referred to only as "the cave." The 51 assembled guests shown include [top row, left to right] Black Lightning and his daughter Thunder, Huntress II, Flash I (Jay Garrick), Plastic Man, Grace, Zachary Zatara, Hawkman II, Flamebird, Slam Bradley, Nightwing, Metamorpho, Hawkgril II, Zatanna, Eddie Fyers, Katana, Jon Stewart, Vixen, Red Tornado, Wildcat I, Martian Manhunter, Power Girl, Booster Gold, [on bride's side from top row] Fire, Adam Strange, Garth (as Tempest), Starfire, Guy Gardner, comic book artists Justin Gray and Jimmy Palmiotti (Palmiotti is the husband of this issue's artist, Amanda Conner), Cyborg, Snapper Carr, Animal Man and his wife (Ellen Baker), Oberon, [in wedding party on dais] Speedy II (Mia Dearden), Oracle, Conner Hawke, Green Lantern II, Green Arrow, Roy Harper (as Red Arrow), [on groom's side from top row] Flash III, Alan Scott, Beat Boy, Bruce Wayne, Frederick Tuckman, John Smalls, Superman, Wonder Woman, Big Barda and her husband Mister Miracle I,and Lois Lane. Always desperate for acceptance and celebrity, Booster should be pleased to have earned entrance into this elite, invitation-only affair. When Deathstroke and his assembled villains crash the wedding, Booster joins in the fray, directly combating the villain Psimon. Other villains pictured include Black Spider, Clayface V, Deathstroke, Double Dare (Aliki and Margot Marceau), Effigy, Girder, Hammer, Hyena, Jewelee, Killer Croc, Lady Vic, Magenta, Metallo, Mister Freeze, Mister Terrible, Prankster, Rag Doll II, Shrapnel, Sickle, Body Doubles (Bonny Hoffman, Carmen Leno),and members of the Fearsome Five (Jinx, Mammoth, Shimmer), and Brotherhood of Evil (Brain, Monsieur Mallah, Phobia, Warp). Boosterrific Review: A light-hearted celebration of the positive social aspects of the extended DC "family" is ruined by an inexplicably contrived, needlessly violent ending. Disappointing.